Outside my bedroom window is a native shrub that is occasionally visited by a cute little bird called the New Holland honeyeater. These beautiful little birds grow up to 18 cm long. New Holland honeyeaters use their long beaks to eat nectar from native flowers, especially banksias and grevilleas. They also eat insects and spiders. They are very fast flyers and play an important role in their environment by helping to pollinate the flowers that they feed on. At breeding time, they build a small nest in the shape of a cup. The nest is very well built and is bound together by spider web. They lay 2-3 eggs at a time and can raise more than one brood per year. New Holland honeyeaters are a very common bird and can be found in woodland and gardens throughout southern Australia. 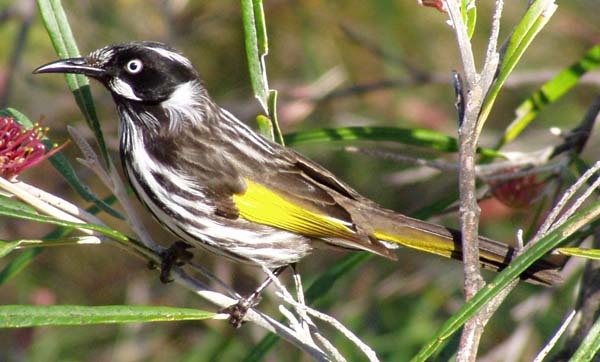 Are there any other interesting facts that you would like to share about New Holland honeyeaters?